Corporate social responsibilities should be a key focus of your business. Corporate social responsibility (CSR) has been a growing theme among businesses of all sizes and industries. Efforts like volunteerism, environmentally friendly practices, philanthropy, and ethical hiring and employment guidelines have become key focuses for companies across the globe. CSR is good for more than just being a socially responsible company; it’s also important to business growth and attracting top talent. Today’s consumers look for brands that are dedicated to CSR efforts, and the younger generation of employees prefers to work for companies who give back to their communities in some way or another, Business News Daily explained. The importance of social responsibility is taught in many MBA programs today. Students in programs such as Villanova University’s online MBA program learn the many ways to incorporate CSR into a company’s primary messaging, and the benefits of doing so. Companies today need to be as transparent as possible. Entrepreneur contributor Jeffrey Hayzlett pointed out that consumers appreciate genuineness above all else. Therefore, giving back to causes that you feel passionate about is paramount, whether it’s an organization in your local community or something on a larger scale. Research causes in the community your company serves, or in which it’s based. Choosing one of these as your main focus will attract customers and employees. Setting up a volunteerism program within your organization is beneficial in many ways. Many employees feel more connected to the companies they work for when they volunteer with their co-workers, according to Conscious Company Media. When they’re working hands-on with nonprofits, it gives employees a feeling of making a difference. Find a local organization that’s in need of volunteers. If there’s one that reflects your company’s mission statement, even better. For example, a food manufacturer might set up a volunteerism program with a local food pantry. 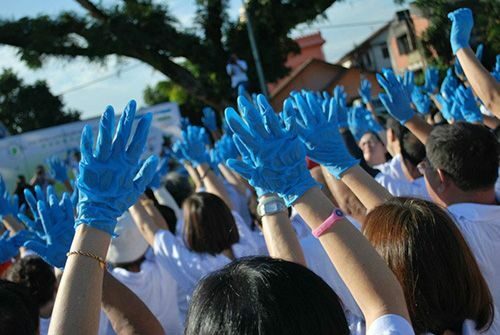 Ask when a group of helping hands would be most beneficial, and set up a volunteer day event. Then, get the word out to your employees. Use every means possible so no one overlooks the opportunity to give back: email, posters in the hallways and bathrooms, notices in the intranet, and mentions in team meetings. Don’t forget to take photos. Having photos of your employees volunteering will give your company great fodder for an excellent cause-marketing campaign. Cause marketing is the practice of promoting your own company’s products and services in conjunction with a nonprofit organization or specific initiative. For example, a women’s makeup brand might highlight a program that supports female entrepreneurship or breast cancer awareness. When putting together a cause-marketing campaign, first decide what the end goal might be, For example, if a toy store wants to partner with local youth educational programs, a certain percentage of sales from a particular period of time could be donated to that initiative. If your company organizes a volunteer day for employees, the cause-marketing campaign can invite supporters of your brand to take part in the activities—just be sure the organization is prepared to handle extra helping hands. Cause marketing is an excellent way to call attention to the nonprofit you’re supporting, while also casting your own products or services in a positive light. If your company has a board of directors, it’s important to get them invested in your CSR efforts. When they’re enthusiastic about giving back in the same way that you, your employees and your customers are, they’re more likely to set aside a CSR budget, and maybe even get hands-on with the initiative as well. Throughout your education in Villanova’s online MBA program, you’ll learn about the importance of sustainability, social awareness and giving back. It’s important to take these lessons to heart, and apply them when you’re in a position of responsibility and leadership.